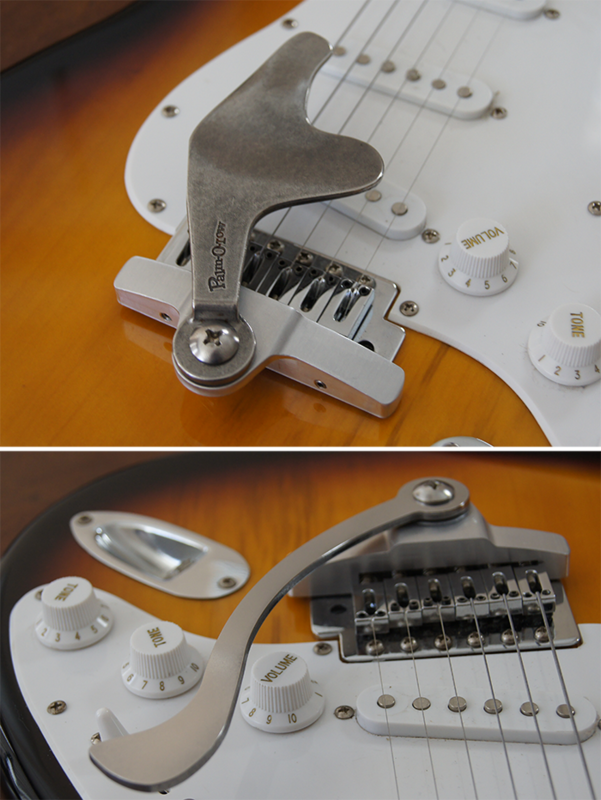 Amazing new vibrato options for your guitar! Stainless Steel | Made in the U.S.A. The patented Palm-O-Low® is a contoured tremolo arm that can be rotated over the strings to provide vibrato when you want it. Fits under the hand or wrist comfortably while you continue to strum, pluck or finger pick. Its unique shape provides new ways of grabbing and holding it, creating an addictive experience not possible using the standard arm. *Left handed players please click here. The patented Trem-O-dapter is a versatile bridge adapter that quickly attaches to vintage style bridges, creating a mounting platform for a variety of tremolo arms, including the Palm-O-Low. 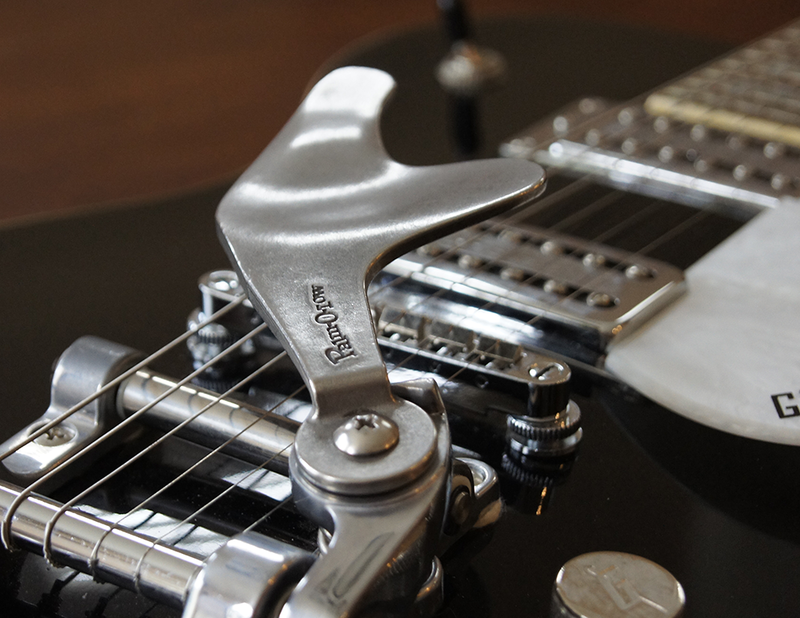 The adapter's center pivot point keeps chords in tune, and it includes a spring mechanism, placing light tension on the arm to hold it in place. It can even be used in conjunction with the standard round tremolo bar. The adapter looks great, and is a fraction of the cost of a new bridge. 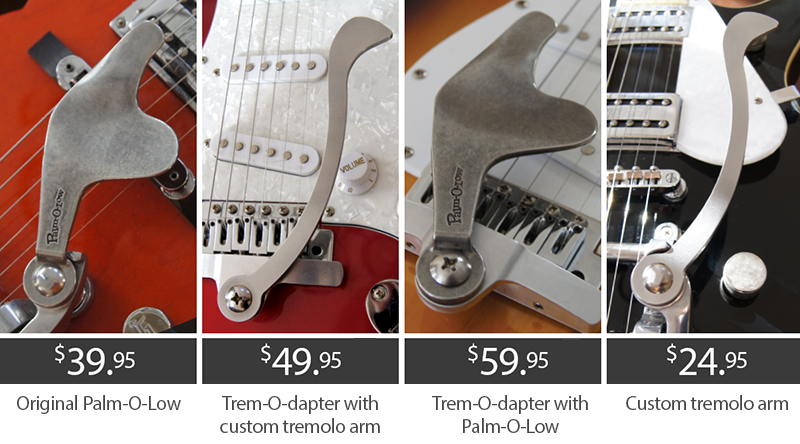 Get a beautiful custom look for your guitar, and enjoy a great preforming tremolo arm for only $24.95! "...I had a lot of other players quite interested in it and I showed them a few of the advantages of having all fingers free .. You have a great product and I am sure that in time a bunch of players will adopt and embrace the new way of wiggling"
"What a brilliant bit of kit!!! The quality is outstanding. Fitment only took 30 seconds and was tight as a drum head. Quick delivery and customer service second to none. Highly recommended #tremolution #palmolow#redspecial"
"With your product, something change with the sustain. No more, no less but just different. A kind of definition and elegance." 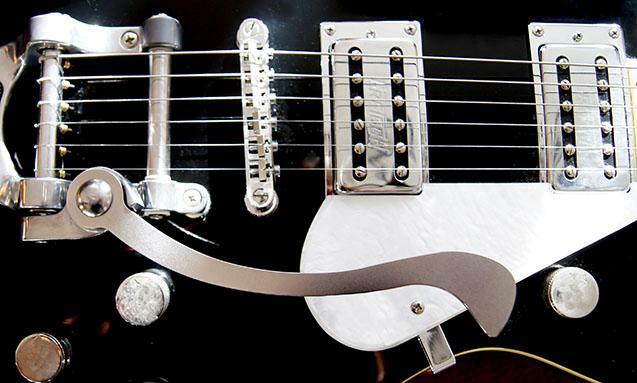 "Bigsby-fy your guitar's vibrato with the Tremolution Trem-O-dapter"
"Meet The Palm-O-Low for Bigsby By Tremolution"